3. What have we learned from long-term trials? One aim of Scion’s flagship ‘Growing Confidence in Forestry’s Future’ programme is to increase the productivity of radiata pine through a move to ‘precision forestry’. This will involve a far more site-specific approach to managing plantations. Through a better understanding of how environment, tree genetics and silviculture combine and interact, researchers are beginning to unlock significant potential productivity gains, and develop superior phenotypes. In recent years, growers have been able to select GF Plus stock, bred from a mix of seedlots (or families) which exhibit above average performance in certain traits e.g. growth, form, wood quality, and disease resistance. Combining a number of seedlots provides a buffer against any individual family performing below average on any given site. GF Plus stock gets the most out of genetics on average: the future is about taking advantage of the potential gains available from identifying individual parents which perform above average on specific sites. New research is enabling these families to be identified from earlier trials: sophisticated new breeding techniques (see Section 4) will enable tree breeders to produce ‘designer’ seedlings from single families or even clone the highest performers and match these to specific sites. optimal final crop stocking: how many trees to leave standing following final thinning. A new model developed by Scion predicts the optimal stand density and stand value, by regime, of radiata pine plantations. The model’s foundation is two well-known forestry site indices – the 300 Index and the Site Index, both of which can now be described for all plantation land throughout New Zealand. there is significant variation in optimal stand density depending on the site. A second key finding is that there has been a strong decline in the relative profitability of pruning over the last twenty years. This applies to both P30 and P40 regimes. The profitability of pruning also appears to be very sensitive to site. The most profitable areas for pruning are located in regions where the 300 Index ranges from moderate to high and Site Index is relatively low. These findings confirm that there is great potential for increasing productivity simply by more closely matching silviculture to site. although optimal stocking is generally greater than 500 stems per hectare, it can be much lower on some sites, especially those with a low 300 Index and relatively high Site Index. 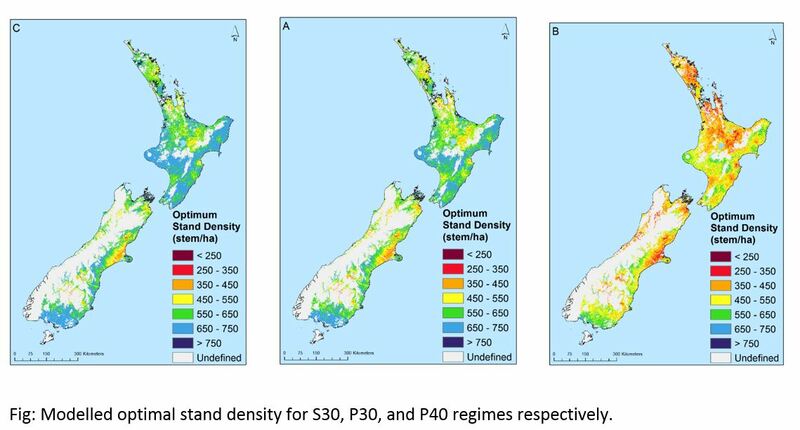 The bigger picture implications of these findings are highly significant: increasing stockings of structural regimes across the whole NZ plantation estate by 100 stems per hectare could result in discounted gross and net revenue increases of $349 million and $156 million respectively over the next 28 years. New Zealand has a large network of long-term trials: Scion’s database includes some 3200 trials, of which 2310 are active. Many of the trials were established in the 1980s, and have been, or will be, harvested in the next few years. The variety of trials and demonstrations is wide, and includes, for example, a series silviculture and breeds trials at 35 sites throughout NZ. These trials were designed to examine the interaction between silviculture and genetics on growth and wood properties. The trees are now at the end of their economic rotation, and before and during harvest, they are providing valuable data. They contain a wide range of genetic material; stand density after thinning ranges from 100 stems/ha up to 1000 stems/ha. Various pruning regimes have also been trialled at the sites. To date nine of the trials have been fully assessed for a number of growth and wood quality characteristics. Scientists plan to assess the remaining 24 trials in this series over the next two years to develop a more comprehensive picture of the impact of genetics, site and silviculture on the growth, wood properties and economic value of radiata pine. There is still much to be learned from these trials, so maintaining ongoing measurements is important (and challenging). Our models and trial data enable us to optimise our silvicultural prescriptions to achieve a particular end goal – for example, to maximise returns from growing structural grade logs. The financial benefits of these changes are considerable – e.g. $2300/ha increase in net revenue at harvest from 100 stems/ha increase in stand density. Large plot trials have enabled the quantification of realized gain for growth and, more recently, value. Again the benefits are large, e.g. around a 30% increase in stumpage compared with unimproved seedlots. Genetics x environment interactions are complex, but there is great potential for further gains by correctly matching genotypes (seedlots) to a particular site. Next generation silvicultural regimes will need to balance a range of considerations, including financial returns, market requirements and risk, and biotic and abiotic risk. During the Forest Growers Research conference, Dr Heidi Dungey was able to break the news that a team led by Scion has succeeded in completing a draft assembly of the radiata pine genome. This marks the beginning of a new era of precision forestry for a plantation species important in many countries. At 25 billion base pairs, the radiata pine genome is eight times bigger than the human genome. Following assembly, the next steps are to understand each piece of the genome and the role it plays in tree growth and resilience. Armed with this knowledge, the forestry industry could breed trees with their desired characteristics much more quickly than by conventional techniques. Once geneticists understand the genome better, it will also be possible to breed a whole range of different trees – for example, from construction timber to biofuels. Genomics scientists will also be able to identify genes with drought and disease resistance and establish them in the wider population much faster. The genome assembly began in 2013 with input and guidance from the international conifer genomics community and was completed in September 2017 using Scion’s newly acquired high-capacity computer server – the largest of its kind undertaking genomics work in New Zealand.